OutsidePursuits review editors chose the following bike racks after extensive testing of ease of setup, stability and mounting style. APOLLO BEACH, Fla. - June 23, 2017 - PRLog -- OutsidePursuits review editors chose the following bike racks after extensive testing of ease of setup, stability and mounting style. The Saris 805 Bones is a trunk mount style bike rack that was the clear winner for stability and ease of mounting. The rack is made from injection molded, high strength plastic that is light and very strong. With 6 straps to secure it to the vehicle it easily wins the Outside Pursuits "Editors' Choice" award. 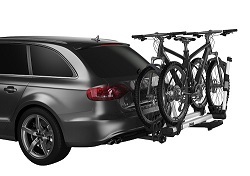 The Thule T2 is a hitch mounted "platform" style bike rack. The bikes are stored on a platform where the tires are locked into place. It is able to accommodate large tire sizes up to 5 inches wide, so it's a good option for the latest "fat tire" bikes. Being very easy to mount and stable it wins the "Top Pick" award. The Thule Sidearm Universal Bike Mount is the best option for bike riders who own a vehicle with factory installed roof racks. The bike rack fits bikes with tire sizes from 20 to the latest sized 29 inch wheels. The secure hook fits over the wheels and locks into places to hold the bikes firmly. Being sturdy and durable, the Thule Sidearm wins the "Best Buy" award. Headquartered in Apollo Beach FL, OutsidePursuits LLC does extensive side by side testing of outdoor gear. The website is a free to the public resource for anyone who loves the outdoors. The website has several categories of equipment reviews, including: Scuba Diving, Biking, Camping, Hiking and Kayaking.